Truth be told, millions like me who had grown up watching DDLJ, wanted to be there on the very same locations, in the very same spots while holding the hands of our beloved. That is what Bollywood does to you and I am unabashedly a desi girl who loves her share of everything filmy. 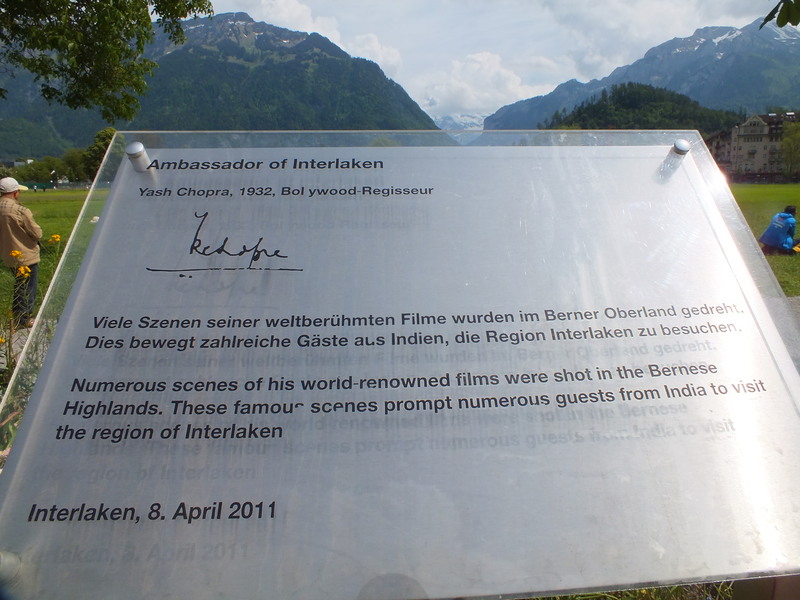 So when the time was ripe to plan my first Switzerland trip along with my homegrown ‘Raj’ in May 2014, the first thing that I did was to research about the places where DDLJ was shot and making ground plan about how to reach them. It was definitely my dream trip. 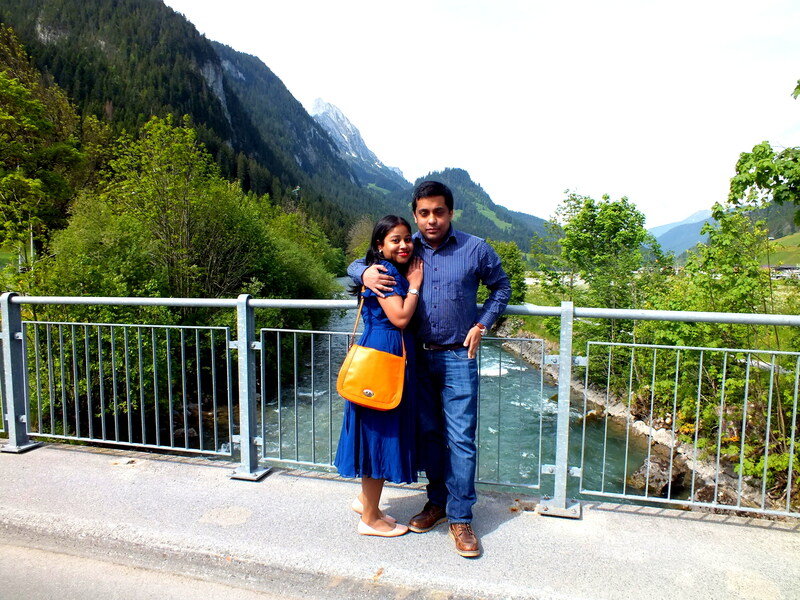 The first day when I landed in Zurich airport, the incredible number of Chooda sightings made it clear that innumerable number of honeymooners had come to relive the Swiss dream that I had in my mind too. This post of mine is my little effort to make life a little easier for all those honeymooners, eternal honeymooners ( like me :P), just a seeker of beauty, fans of DDLJ for whom age is just a number and everyone who is young at heart to map your own dream Bollywood love story. “Come…fall in love” should be our mantra for all seasons and all ages . The best time to visit Switzerland is probably between May to September. The weather is the loveliest and you also get to experience the romance of the European summers. I had a long Swiss trip covering many other places and locations which should also be in your ‘must visit’ itinerary, but I managed to fit in the bits and pieces somewhere. 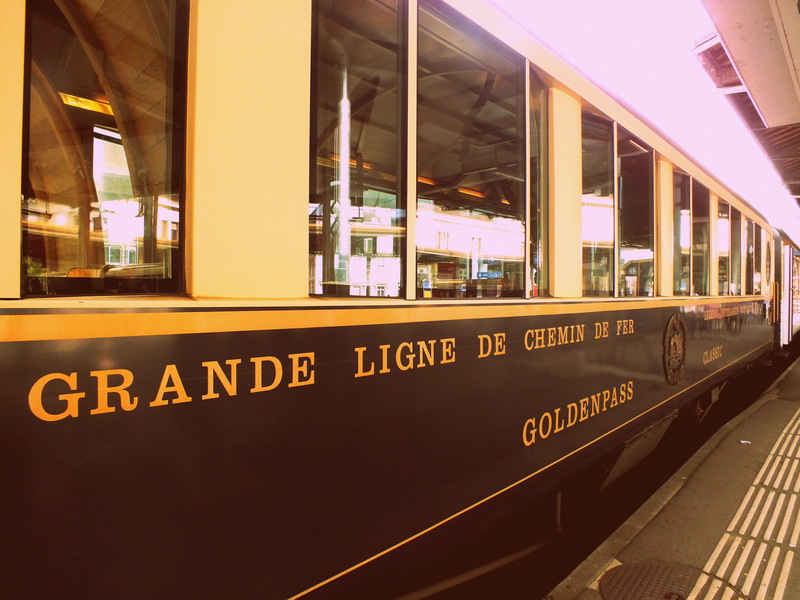 The majority was covered during one day when we boarded the beautiful and luxurious Golden Pass train covering the scenic Golden pass route which covers most of the Bernese Oberland region in Switzerland. This is the region where Yash Chopra has shot many iconic scenes and songs of his movies. We chose to ride the Golden Pass Classic train with vintage old world charm from Montreux while beginning our DDLJ trail. And I fell in love with the train. My tip: Romance is always vintage and this should be your chosen train for the Golden Pass route. I travelled on the Golden Pass Panoramic during my second Swiss trip and it was great too, but I liked the classic one more. A window with a view…and the lamp to die for! Our first destination was the picturesque village of Saanen. This is the place where many memorable portions of the film was shot. It is a very small town and all the shooting locations are located quite nearby, in fact, very close to the railway station. However, it is a lovely quaint town with practically nobody in visibility. so be prepared to find the locations on your own with the help of all the markers provided in the film itself. Well, the railway station has a story to tell of its own. There is scene in the movie where Raj and Simran wait to catch the next train to reach Zurich after they missed their trains earlier and it was here in this beautiful train station that the scene was shot. That place on the right hand side of the station is where Kajol sits and is busy sending post cards back home. SRK arrives and then they have a heart to heart conversation about love and life. Kajol tells him that her marriage is already fixed and both of them realise that somewhere beneath, their dreams about the unseen and unknown loves of their lives, were crossing paths. Remember this place? 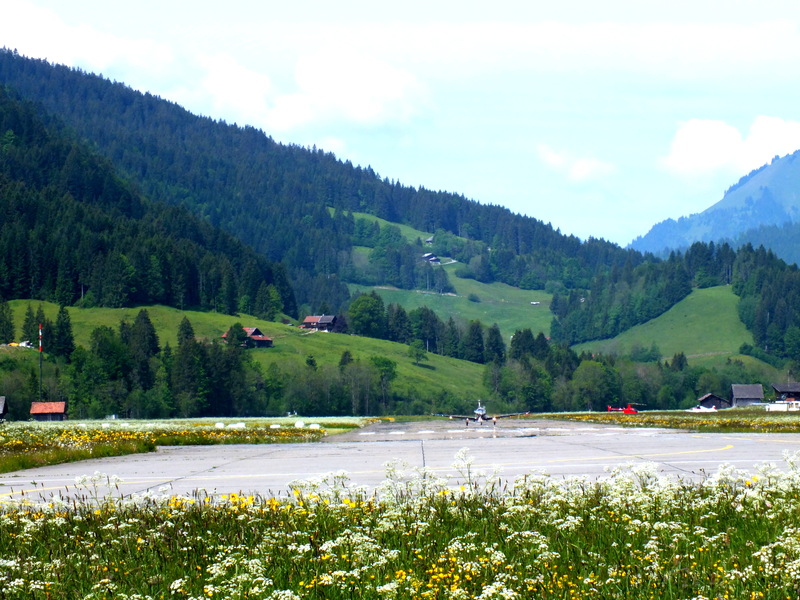 This is the Saanen Airstrip located about 5 minutes away from the railway station. where SRK is shown competing against an airplane while Kajol’s character ‘Simran’ sings “Mere Khwabon mein jo aaye” in her own dream world. As I had described this picture in my Facebook album and I will put the exact words here – “SRK chasing down a airplane and creating ripples across my heart! ah! those days!”. Well! ah! yes! The next destination was the iconic DDLJ bridge which is situated right next to the railway station. All of us have tried to do that “Paalat, Paalat, Paalat” trick once in our lives to try our luck in that eternally mysterious game called ‘love’. Well, this is where the “Paalat” scene was shot and also the moment when Raj and Simran do a tango while the end credits roll out in the film, was shot here. Luckily one sweet american tourist who was hiking out in the hills nearby stopped to click a photo of us on the bridge. My Yay! moment for the day was made. 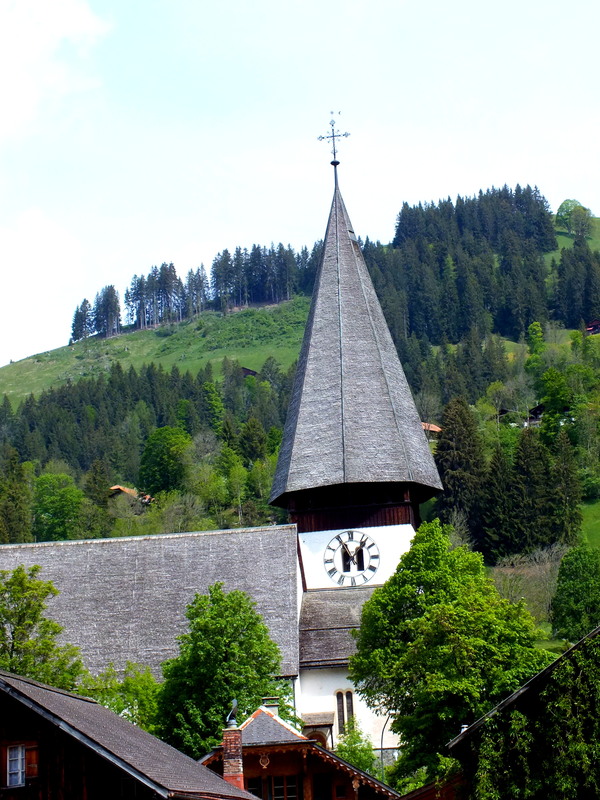 The next destination was the one that many DDLJ enthusiasts mark as the DDLJ church – the Saanen church. However, my research shows that the church resembles the exteriors of the one shown in the movie, but this was not the one. However, you may just try your luck. Our next destination was Gstaad. It is another beautiful town located in the Bernese Oberland region only and probably a few train stations away from Saanen. You may take the next train on the Golden Pass route to reach Gstaad or take a bus from Saanen also. Swiss public transport system is one of the best in the world and you have to travel on it to believe their level of accuracy. Gstaad is generally known as the favourite Ski destination of the rich and famous (the Nawaabi couple of Bollywood Saif and Kareena are a regular there), but DDLJ seems to have left a stream of crazy fans arriving here evrry now and then and do their own bit of “Zaara sa jhoom loon mein…arey nare nare na!” . 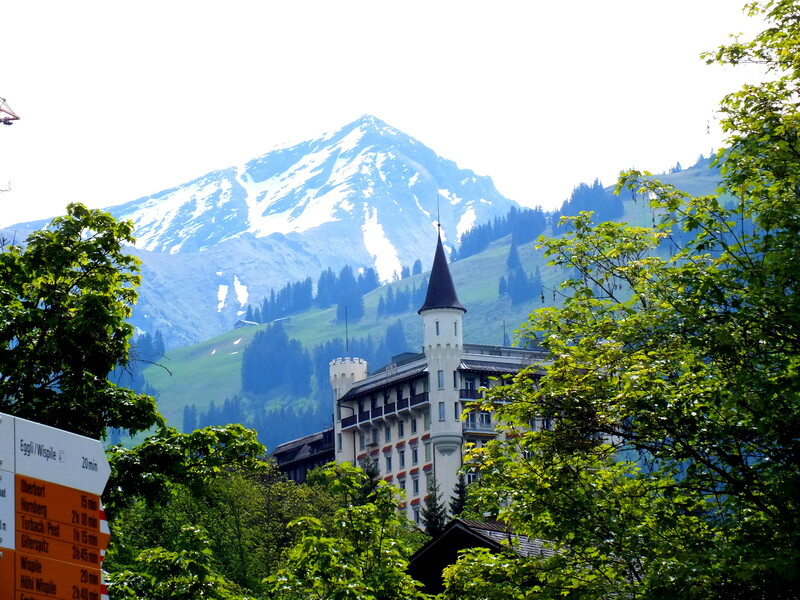 Legend has it that Yash Chopra visited Gstaad for his own honeymoon and fell in love with the beauty of the region. 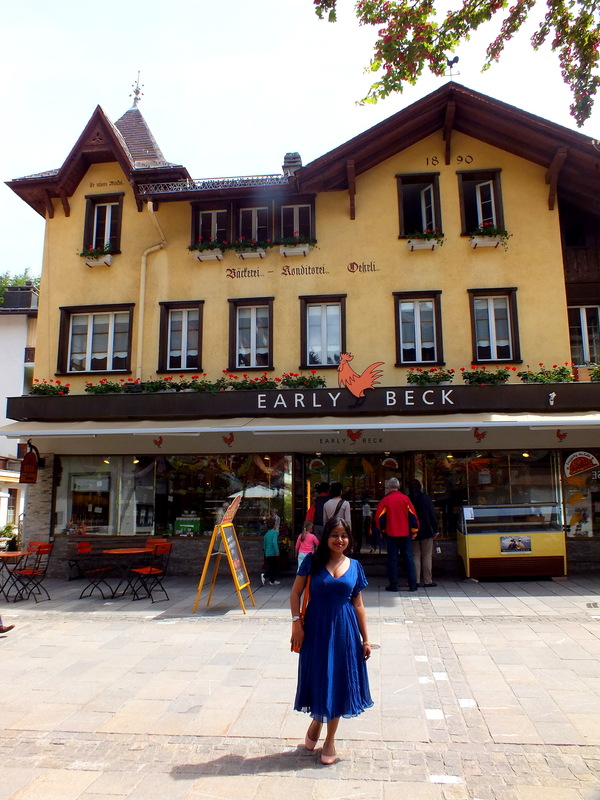 The first DDLJ memorabilia associated with Gstaad is the Early Beck shop. 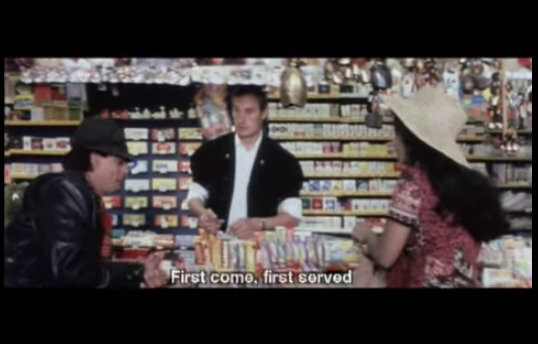 Remember that confectionery shop in the song “Zara sa jhoom loon mein” where Kajol wreaks havoc? 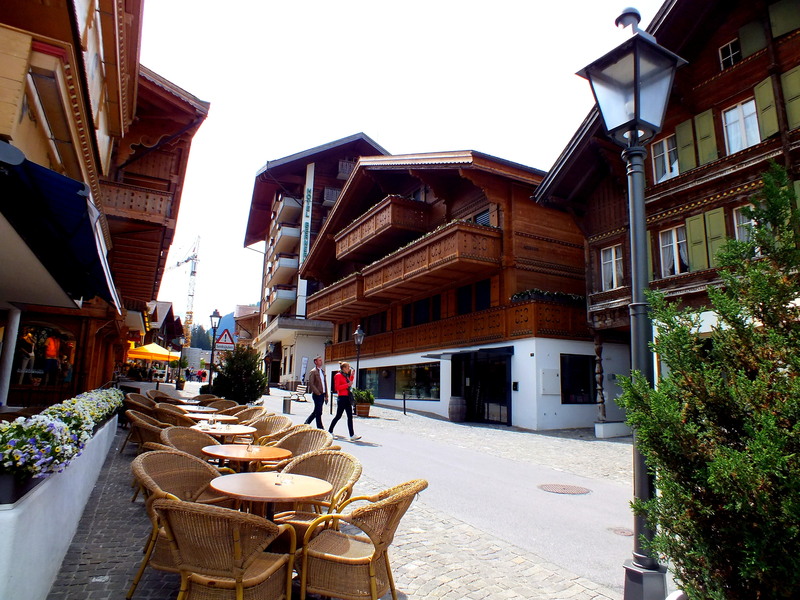 Simran is busy painting the Gstaad promenade red, blue and yellow…. ….and we could not stop admiring the sense of beauty that Swiss people seem to born with. clicked on the same Gstaad promenade. It is again a small sleepy town and you can just cover the length and breadth of it within an hour. Okay! if you are vigilant and a die hard DDLJ fan like me, it is unlikely that you might have missed this. 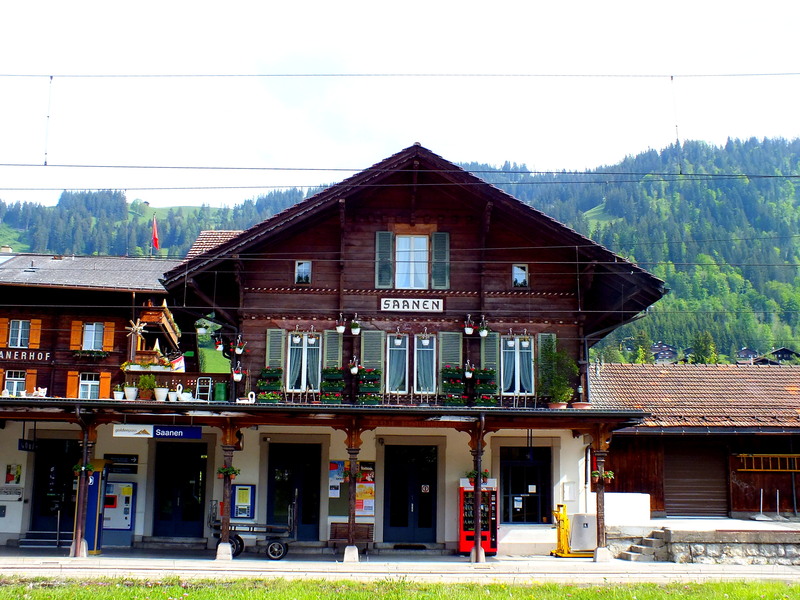 This is a famous hotel in Gstaad which appears in the background when Kajol boards a train engine in an inebriated state with SRK chasing her. Can you spot it here? 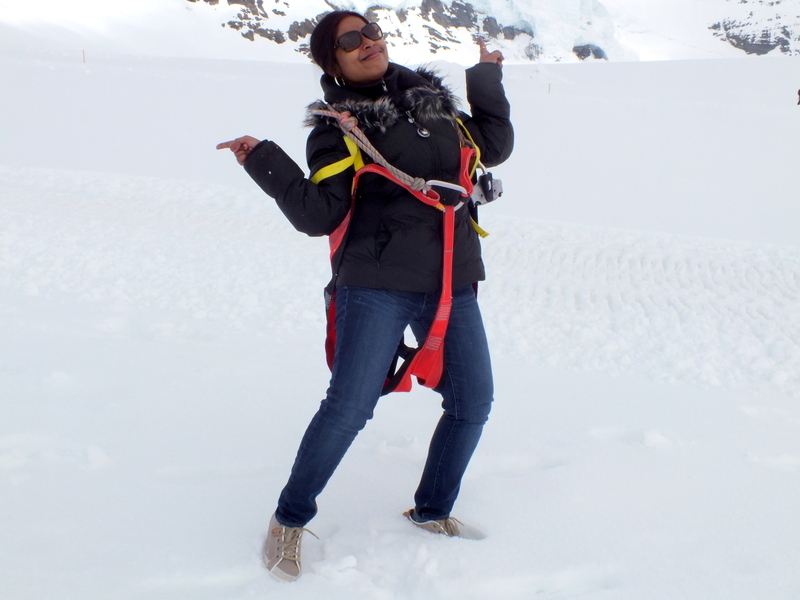 While we are on the “Zara sa jhoom loon mein” mode, I will talk about another destination which was featured in the song – the Jungfrau mountain range. We separately visited Jungfrau from Interlaken and it takes a whole day to complete the trip till the top of the mountain and back. The Jungfrau railways is a sheer feat of engineering. The snow clad serenity is featured in the same song when Simran in red dress serenades her way to our heart. 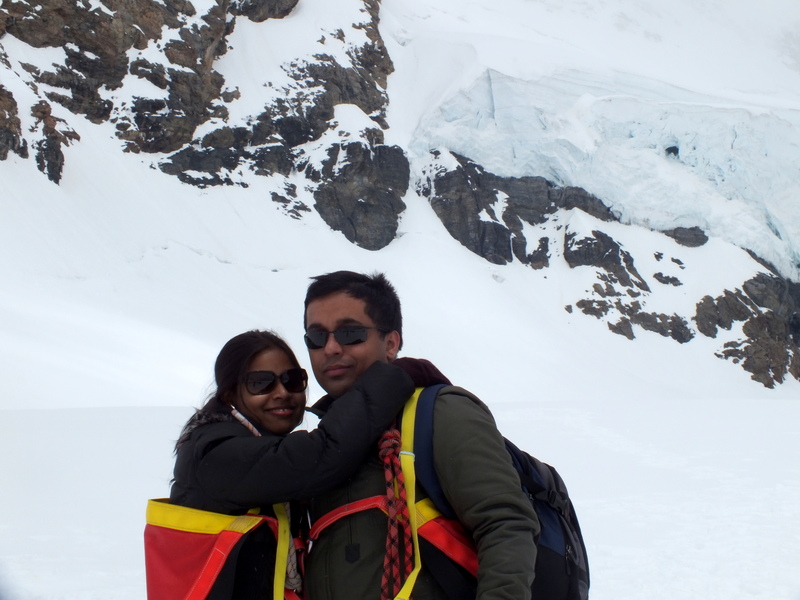 ‘Us’ on top of Jungfrau. 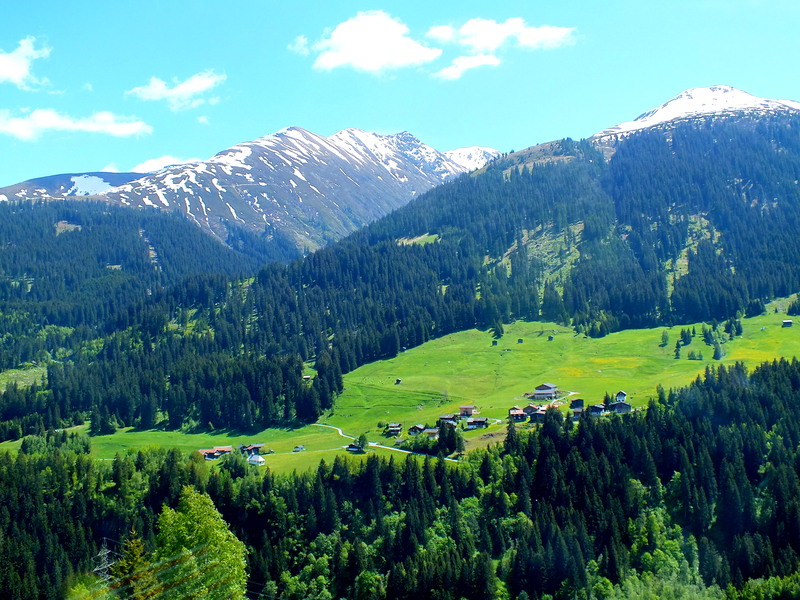 Going back to the Golden Pass route, our next stop was Zweisimmen. You can either take a bus from Gstaad to reach Zweisimmen or just take the next train from the Gstaad station to reach Zweisimmen. This is also the place where the Montreux- Zweisimmen portion of the Golden Pass route ends. As you may wait to catch the next train on the Golden Pass route connecting Interlaken, you may also visit some memorable places in and around the station where some memorable portions of DDLJ was shot. 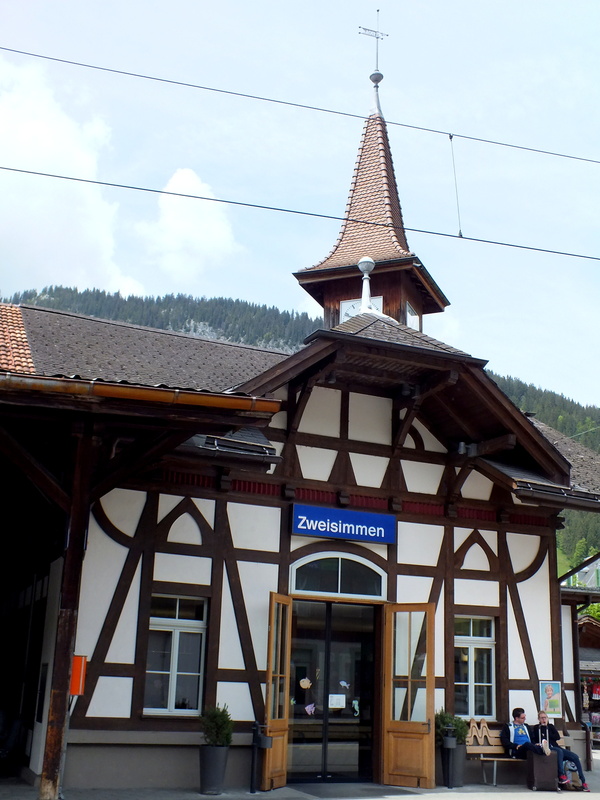 Zweisimmen is the train station where Kajol aka Simran misses her train to Zurich and there begins her whirlwind journey which ultimately leads her to find true love. Just like Raj, we also hope that she misses the train, every single time the scene is played out in the movie. 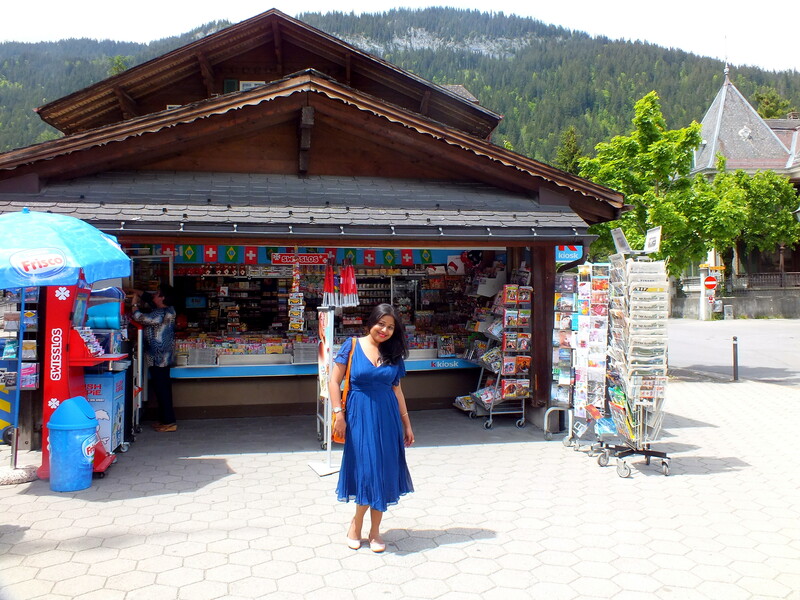 Remember this Kiosk where Raj and Simran fight with each other while she runs against time to buy the most famous Swiss souvenir worldwide – ‘the cow bell’? Well, the kiosk is still there…there is in fact only one right near the station and it is not difficult to spot. Zweisimmen is again a quiet picturesque town and it is not very difficult to spot out the DDLJ memories left here, there and everywhere. Probably a huge number of Indian tourists flock the shop every year and that is why the shop owners seem to be aware of the popularity of the movie. This is me standing in front of the Kiosk. And this is me again. The happiness on my face is due to the miniature cowbell souvenir that I bought from the same shop where Simran buys the bell from, in the movie. And if the fight with cowbell was here, can the missing of trains be far behind? My research showed the the place where Simran runs behind the train she is supposedly missing was the parking lot just opposite the platform number 8 of the Zweisimmen railway station. Simran missing the train. Notice the place where Kajol is running. The Parking lot easily passes off as a part of the Station and the platform. 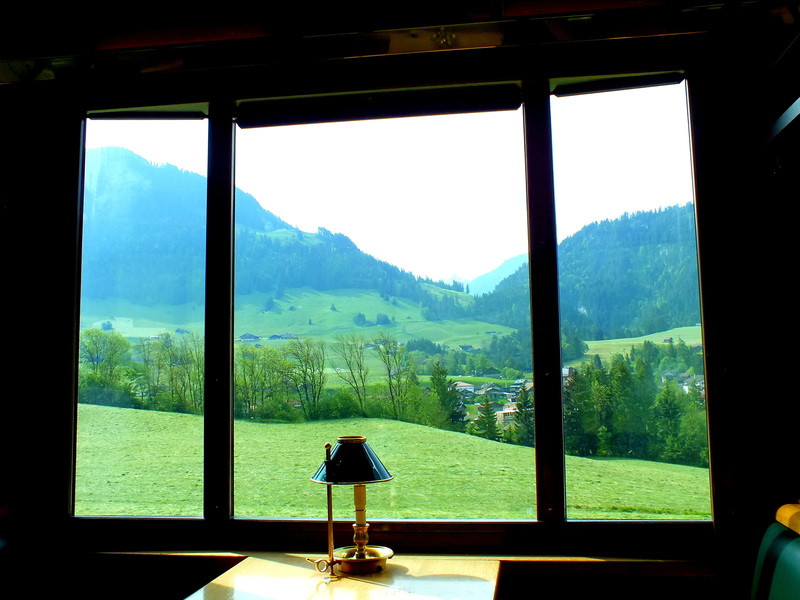 The booking counter where Kajol goes to inquire about the next train to Zurich is locate right behind the Parking lot. Unfortunately, I forgot to click a picture of that. 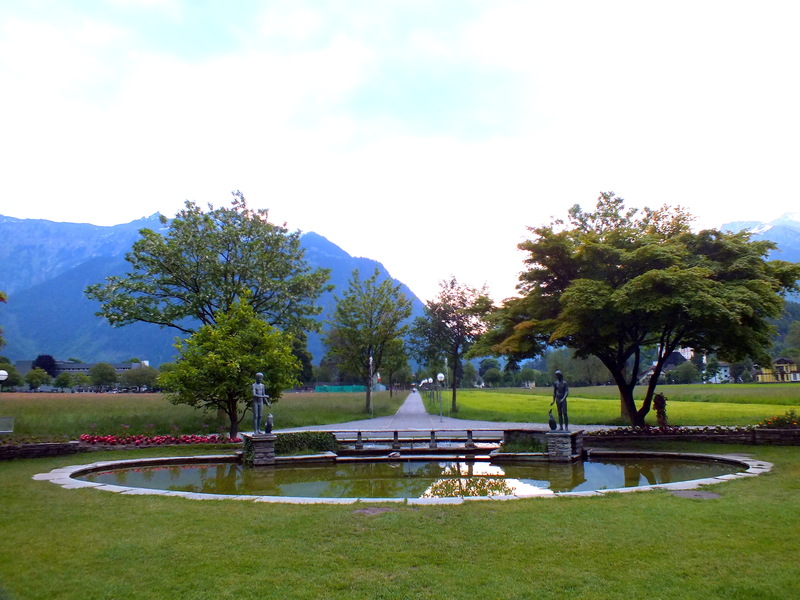 The next DDLJ location that I spotted in Switzerland was in Interlaken. While you reach Interlaken from Zweisimmen completing another part of the Golden Pass route, you are bound to admire this lovely little town surrounded by lakes. Remember this scene where it is shown right after the song “Ruk jaa o dil deewane” that SRK tricks Kajol while convincing her that he is in a mood to apologise for his antics? 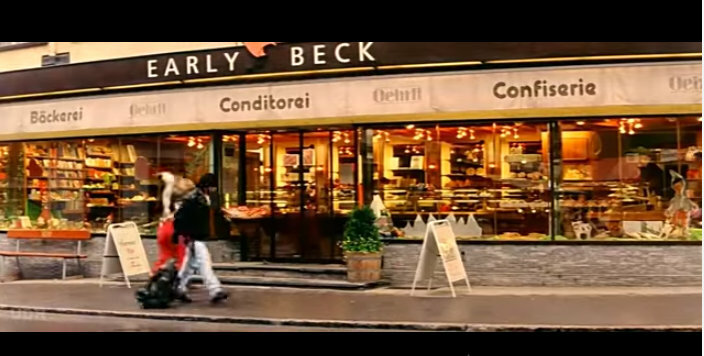 The scenes was shot on the Interlaken promenade and you can catch a glimpse of the famous Victoria Jungfrau Hotel right before this scene in the move. This is the fountain in the background where the scene was shot. For a girl who has grown up on a fair share of Bollywood, this was indeed a proud moment. 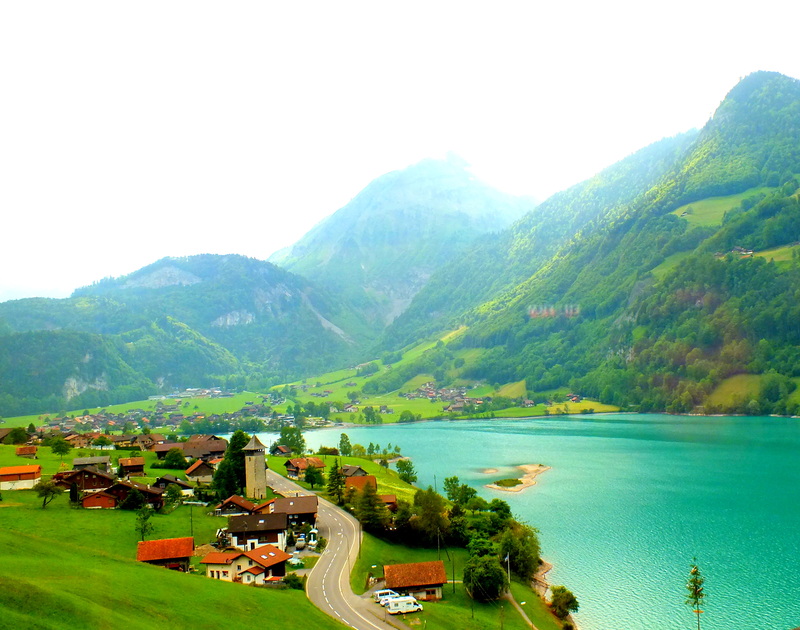 While doing the Interlaken to Lucerne part of the Golden Pass route, you may also spot the Lake Lungerer See, where a few scenes from the song “Tujhe Dekha Toh yeh Jaana sanam” was shot. Absolutely fantastic post…i could actually relive the memories of DDLJ all along. Thank you Alok for reading and appreciating and welcome to my blog 🙂 Yes, the charm of some of the spots remain the same. Wow! Great concept , great pictures! Love the idea of following the DDLJ trail. 🙂 May you live happily ever after just like Raj and Simran. this is an awesome write up! I will be visiting Switzerland in 3 weeks. Cant wait to visit DDLJ shooting places! 🙂 thanks! hiii. great write up. 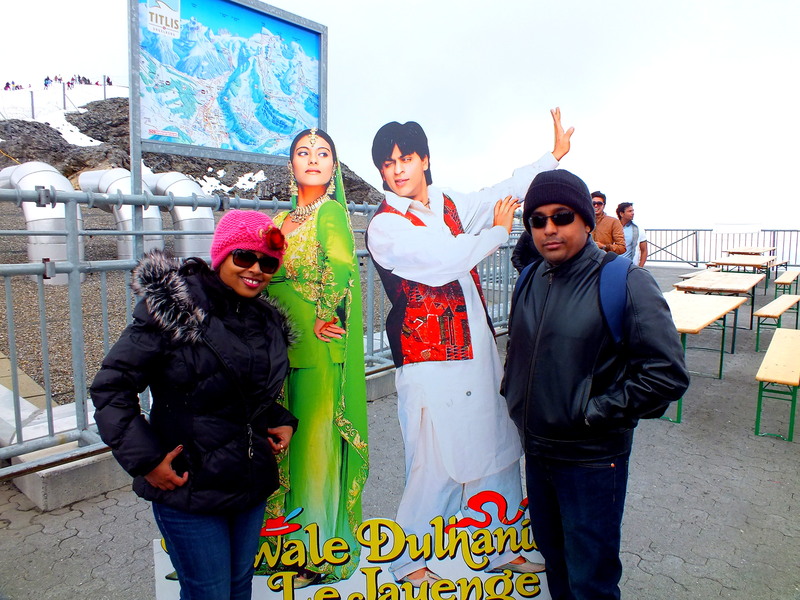 my sister and i went to switzerland just because DDLJ! very beautiful indeeeeeed. if u don’t mind i’d like to copy paste certain of your words for fb status. please? thanksssssss! I hope to know someone of you friends ! Being a huge DDLJ fan myself I really enjoyed your blog. I came across it when I was looking for Swiss travel tips. im not far from the place i only now discovered that was switzerland…. I am an Indian living in Switzerland since the past 15 years.. I had seen ddlj in India when it was released (1996), but after reading your article, I saw the movie again with my Swiss colleagues. And now they are planning a trip to the destinations mentioned. Even though they have all visited these places, but now they would like to visit the memories of simran n raj.. I am sure you would be feeling as proud as I am.